We're two eager travelers with roots in the US. Having explored quite a bit of our home country together, we set our sights abroad and kick started our foreign travels in Southeast Asia. With everything we owned in our backpacks, we set off on our five-month trip. What day is it today and where did we stay in Mui Ne? Today is Wednesday, November 21, 2018. We woke up to an amazing sunrise from the balcony at the Mui Ne Gardens hostel. The blazing sun heated up the area tremendously before we had even left for the day. Most places weren't open yet when we had left to get some breakfast, so we went to the first place that was. Opting for some pho and fruit smoothies, we weren't the least bit disappointed by our choices. We returned back to the hostel to shade ourselves from the sweltering heat and used the morning hours to be productive and catch up on some projects. After awhile, our bellies started to grumble again, so heeding their advice we strapped on our sandals and got to walking. Well, we walked a couple of meters before hauling a cab and catching a ride to what we thought was a vegan restaurant. The shops along the street were mere exoskeletons of what was; faded billboards advertising outdated information lined the sidewalk. Luckily a few shops ahead of us we spotted a vegetarian restaurant. Itching for some fresh greens, we entered and seated ourselves as a gentleman in flip-flops brought us out some iced tea and menus. Ordering some veggie noodle dishes and Vietnamese rice pancakes, we were amazed by the flavor. Each bite was better than the last and we left craving more. What did we explore today in Mui Ne? Walking our way from the hostel to the Red Canyon perhaps wasn’t the best of ideas, given that it was a bit longer than expected—roughly 30 minutes—leading us through zigzags of dried fish on the sidewalks and blaring truck horns. Nevertheless, we made it from the highway road to a dirt patch, leading into the water stream that holds the Red Canyon. There was no clear direction from the path to the canyon itself. There are countless turnoffs into areas where the locals sell random items and charge you a 5000 VND entrance “fee” to pass through. All a scam if you ask us. It takes you 10 seconds to walk beyond their premises into the mud colored river. Whether you try to dodge this fee or not is up to you. Following the river you’ll meet a giant hill with countless footsteps buried in the red sand. Climbing up, you’ll gain an vantage point above the river below. There isn’t much else to see in the surrounding areas, so walking the canyon itself is the highlight. The red sand dunes here are a pretty marvelous sight to see. Etched and carved by gusts of wind over an impressive length of time, the red clay is soft and squishy underfoot. The Fairy Stream gently runs down below and merchants were set up with piles of fresh coconuts ready to be chopped. Hunting another sunset led us off the beaten path filled with tourists and resorts. A couple turns away from the main street, our taxi cab driver led us into what seemed like a remote village. The houses were crumbling and falling apart, cows roamed freely and grazed upon the small patches of grass, and children seemed to stop and stare when they saw us. Nevertheless, we were greeted with a friendly "hello" and smiles from the kids. We walked a couple feet and were amazed by the views. The expansive ocean reflected the color palette of the sun as the waves gently lapped against the jutting rocks near the shore. Fishing boats nested along the sandbar as locals jumped in the sea and played with their dog. Looking away from the beach stood a hill with sand and sharp rock. Atop was an old building bereft of civilization. It felt odd as we climbed its steps, witnessing many graffiti markings and oddly swept floors. They were clean enough to witness a glow; that of the sunset. Stepping through we felt the gush of wind embrace our sweaty shirts smacking to our chests, hats roughly nudging in a spin. Gripping ourselves for the sight, we stepped down the hill towards the danger of shallow water and rough terrain. 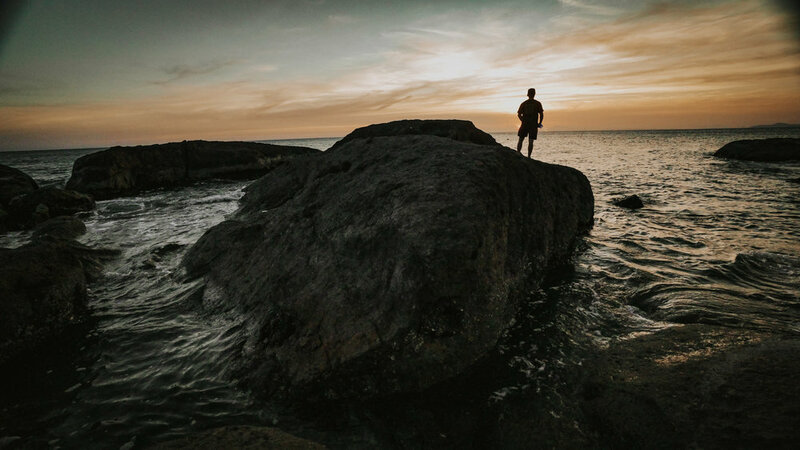 Climbing over rocks and jumping between pools of water, we made it to the end of the land to behold another glorious sunset. 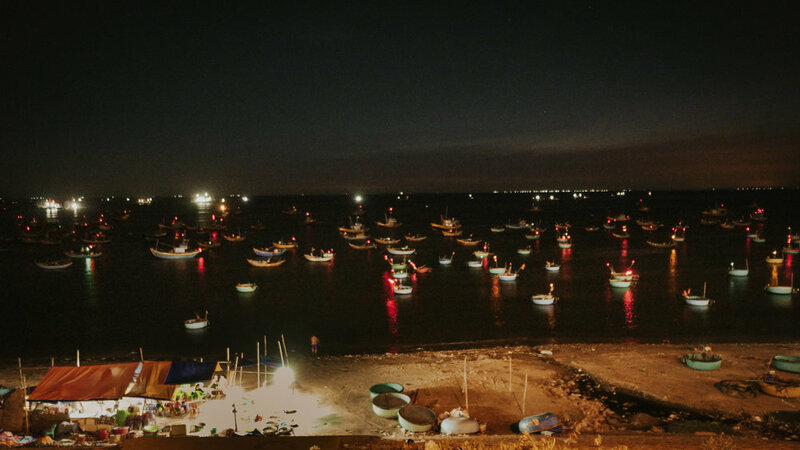 At night, these fishing boats cuddle together alongside the harbor with their glimmering red lights flickering in and out of existence. Offering a stark contrast against the pitch-black night sky, it was certainly a sight to see. How much did we spend traveling in Mui Ne? While no sunset is truly the same, seeing them back home and in another country is both familiar and indifferent. What better place to see the sunset than Mui Ne! Where would you go for a great view of the sunset?